Bedford Town have made further new signings ahead of the upcoming 2018/19 season. Striker Paul Benson, who joined on loan midway through last season from Boreham Wood , is making a permanent move to the Eyrie after signing this Tuesday. Benson has also agreed to become a player/coach as part of boss Jon Taylor’s management team, as his Football League and top non-league experience will help the Bedford players immensely. Benson is also in the latter stages of completing his UEFA ‘A’ licence, which will provide a great bonus to the club going forward, especially helping assistant boss Jack Cassidy on the coaching side. 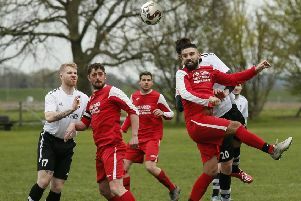 The striker has vast experience at both National League and Football League level, and can count Charlton Athletic, Swindon Town and Luton Town on his footballing CV. The Eagles also confirmed this week that Nathan Abbey has joined the club, also as a player too. Abbey is the latest name on Taylor’s side of the management and he will monitor the match analysis and also play a part in player recruitment. The previous week saw the club sign six players to bolster the squad. The signing frenzy started with the club securing the signature of defender Jordan Jarrold, who last played for the Eagles in 2015. Next on the list were midfielders Dean Dummett and Callum Donnelly, followed by Tommy Hull, who can play in the centre of defence or midfield. The next additions were the returning midfielder Taylor Rhiney and striker Jermaine Hall. Further recruitment is expected in the coming weeks.